I’m an Imposter and I’m Owning it! 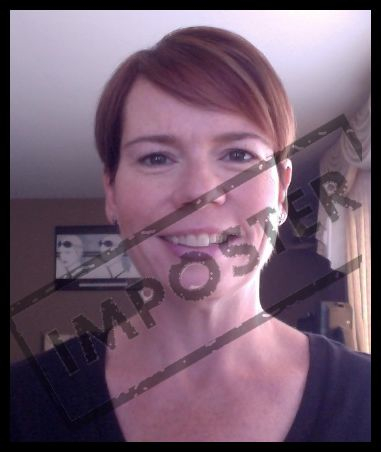 Yes, I’m Jen the Imposter. Not for long though as I’m back on track with my weight loss journey! Yes, I said it. I am an imposter. At least that’s how I feel these days. I feel fat. I feel defeated. I feel I’m heading on up the scale, not down the scale. I am lost, frustrated and terrified. Mostly I feel this way because of the dreaded scale. Of course I’ve said in the past that the scale is not the end all, be all in weight loss success. I can’t deny it’s importance in keeping track of my health and right now I’m four and half pounds above my weight window. At least that’s the number that’s in my head. I haven’t entered it in the My Fitness Pal program for the past two weeks since it doesn’t count if it’s not written down, right? Before my gastric sleeve surgery, a gain of five pounds didn’t mean much. What was another five pounds on an obese body? Now that I’ve lost 100+ pounds, five pounds means more. It means I have the start of a muffin top and my breasts feel a little bigger. I can still fit in my clothes so that’s a relief, but I’m sure another pound could make my jeans tight and my bra tighter. Pudgy and doughy are good for pastry, but not on my body! Especially in light of all the work I did to get to this place. So I’ve felt like a fake thin person for the past two weeks. While on the outside I think I look the same as before this five-pound gain, but on the inside I don’t. I feel like a fake healthy person. I started eating more protein bars and the scale is showing the results. So I stopped buying them and what did I do, but start eating my kids’ protein bars. Sigh. Bars are out in this house as well as bread for me. A bagel and cream cheese here, a slice of peanut butter toast there is not something I can handle these days. Time to own that face and step back from the carbs. Even though I’m almost two years out from my surgery, I am very fortunate to have the support, encouragement and compliments from my family and friends. For the past two weeks it’s felt so wrong to say “Yes, I’ve lost 100+ pounds.” to people when in fact it’s only 97.5 pounds these days. I feel like such a liar. But you know what, I’ve finally realized that we’re all imposters at some point in our lives. We all put on masks and act like who we’re supposed to be either to our community or to ourselves. Sometimes things just go off course or just plain wrong. I think it’s important to be who you want to be and need to be, but if you mess up, it’s really OK. Deep down, I know I’m not a failure. I have accomplished a lot and it’s fine to fail from time to time. It’s coming back from the failures that help define who you are. So, yes, right now I may feel like a weight loss fake. And technically I am since I’ve gained weight and I let my exercise and eating habits go to hell for the past few weeks. But you know what…I’m going to own it. Yes, I’ve screwed up like I’ve done in the past, but this time is different. I now know that I can be successful. I’ve maintained my weight loss since July 2014 and that’s damn impressive! I can do it again if I really, really try. That’s my story and I’m sticking to it. Thanks for letting me share my failures of the past few weeks. If you see me with a bagel, feel free to gently remind me to put it down. Or actually feel free to slap it out of my hand. Perhaps it’s time for some tough love to get me to the next stage of my weight loss journey. Time to build up my strength, pride and accountability as I go back Down the Scale…. So this is Middle Age? Yes, I’m a middle-aged woman! At 46, I’m in the best shape of my life! My weight loss journey keeps getting better and better. *Being in the best shape of my life! Losing 100+ pounds means I am in great health. I don’t have high blood pressure any longer and I’m not pre-diabetic. I am rarely sick and my last doctor visits have all been check-ups with good results. *Being physically active! If you told me two years ago that I would be a middle-aged runner, I would have asked what you were smoking. Never in a million years would I have imagined myself running and entering races. *Being able to keep up with my kids! I had my children at what the medical profession calls “an advanced maternal age”, so I originally had the mindset that I would be on the sidelines watching my kids. Wrong! I love walking and hiking with my family. I am thrilled and proud that I now model healthy living for my children. *Being a priority is OK! I used to think that my needs and desires needed to be last in order to be a good person. I felt I should say yes to all requests and maintain relationships even if they weren’t healthy. Finally, I realized that to be the healthiest and happiest person, I need to make myself a priority. Taking care of myself, makes me a better mother, wife, friend and person. *Being unsure is OK, too! When I was in college, I was terrified of not knowing what I wanted to do with my life. That fear was pointless as I now proudly say that my life is turning out pretty well! Even in my younger years when I didn’t know what I wanted to do or who I wanted to be, I managed to figure it out. Now that I’m middle-aged I’ve realized life is always changing and that it actually is a good thing. I’ve realized that I’m the type of person who actually thrives on changes and new goals. It makes me stronger and that is actually a positive and not a negative! So, for me, middle-age is a gift. It doesn’t mean being old or being settled or being stagnant. It’s given me an incredible gift of looking back at the first half of my life and realizing it’s been pretty good! Sure I’ve had heartbreak, challenges and pain, but I’ve learned from all that. I’m sure I’ll repeat some of it again, too. And that’s just fine with me. I see how I can face challenges and continue to grow into the person I want to be…for now at least. I know that Jen, the middle-aged woman, will continue to change as the years go by. I look forward to seeing where I go in the next 46 years!